I was sent an email this week by a vegan user who wanted to draw rarefaction curves using rarecurve() but with different colours for each curve. The solution to this one is quite easy as rarecurve() has argument col so the user could supply the appropriate vector of colours to use when plotting. However, they wanted to distinguish all 26 of their samples, which is certainly stretching the limits of perception if we only used colour. Instead we can vary other parameters of the plotted curves to help with identifying individual samples. To illustrate, I'll use the Barro Colorado Island data set BIC that comes with vegan. I just take the first 26 samples as this was the data set size my correspondent indicated they had available. 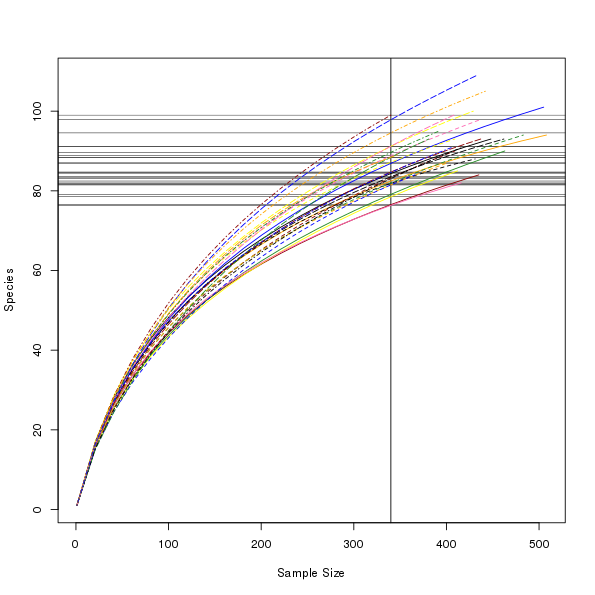 raremax is the minimum sample count achieved over the 26 samples. We will rarefy the sample counts to this value. 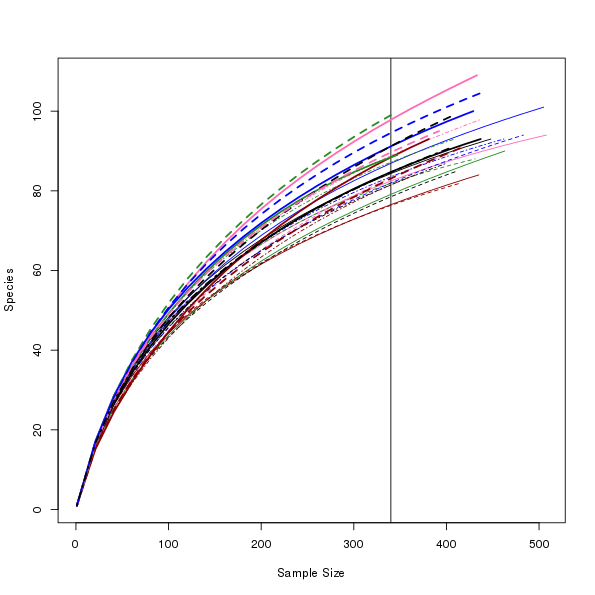 First attempt at rarefaction curves with custom colours. Note that I saved the output from rarecurve() in object out. This object contains everything we need to draw our own version of the plot if we wish. For example, we could use fewer colours and alter the line thickness1 instead to make up the required number of combinations. Second attempt at rarefaction curves with custom colours and plotting. Having done this, I don't believe this is a useful graphic because we're trying to distinguish between too many samples using graphical parameters. Where I do think this sort of approach might work is if the samples in the data set come from a few different groups and we want to colour the curves by group. An attempt at rarefaction curves output with custom colours per groups of curves.